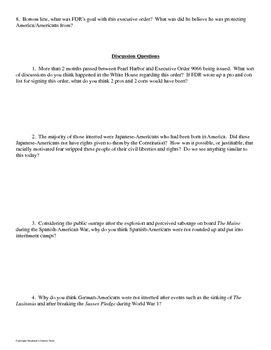 Students read Executive Order 9066 about Japanese Internment during World War 2 (WW2, WWII) and answer 9 questions of varying difficulty (answers included where appropriate). 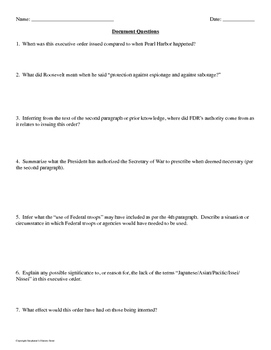 There are then 7 discussion questions which students could pair up to discuss and answer before having a whole class discussion on these questions. This would be great for a sub! 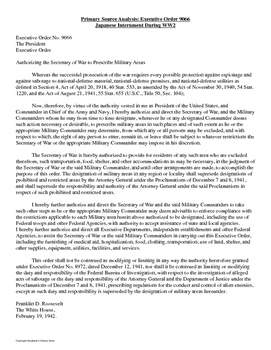 --Summarize what the President has authorized the Secretary of War to prescribe when deemed necessary (per the second paragraph). --Infer what the “use of Federal troops” may have included as per the 4th paragraph. Describe a situation or circumstance in which Federal troops or agencies would have needed to be used. 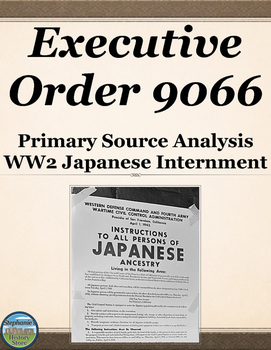 --Explain any possible significance to, or reason for, the lack of the terms “Japanese/Asian/Pacific/Issei/Nissei” in this executive order. --What sort of discussions do you think happened in the White House regarding this order? If FDR wrote up a pro and con list for signing this order, what do you think 2 pros and 2 cons would have been? --The majority of those interred were Japanese-Americans who had been born in America. Did these Japanese-Americans not have rights given to them by the Constitution? How was it possible, or justifiable, that racially motivated fear stripped these people of their civil liberties and rights? Do we see anything similar to this today? --It was not until 1988, under President Reagan, that an official apology was issued to Japanese-Americans and compensation distributed. Why do you think it took so long for America to acknowledge speak out on said actions? Was an apology and $20,000 (paid to each surviving victim) enough to compensate for years of living in (sometimes deplorable) conditions, for being uprooted, being branded possible spies and traitors, for losing homes and businesses, etc?